How long does it take to cook something ? Sometimes the cooking time may take longer than the preparation time, sometimes, its vice. For most Chinese stir fry, the cooking time is relevantly shorter than prep time cause stir fries are usually like a quick toss in the wok with high heat. So far of all different types of Chinese cooking I’ve tried, I find that steaming is very very very easy. Extremely easy and saves time especially for busy working people. Because the steamer will do the work and you don’t have to physically stand in front of the wok to throw in ingredients and stuff. It’s like microwave, only healthier. I prepared this dish while I was on my way out, but I still need to serve some food for my brothers eating at home. 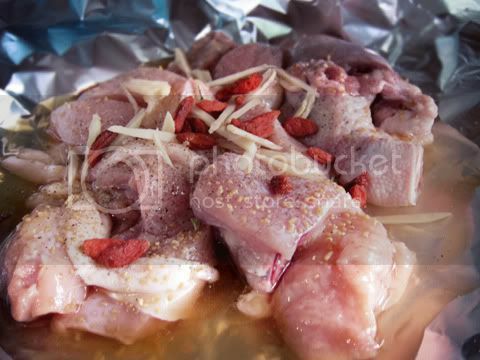 So I put the chicken and seasoning to marinate in the morning. Then when it’s almost dinner time, I pop the chicken in the steamer for 20 minutes while I head for my shower and get ready. When I’m done, the chicken should be done too !! See, easy right? 2. 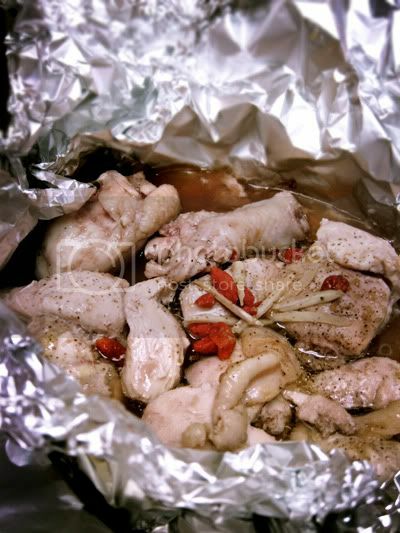 Lay aluminium foil on the heatproof plate, place chicken in it and all ingredients. Wrap the foil. Let it marinate for a couple of hours. 3. Steam in preheated steamer over high heat for 20 minutes or until chicken leg is cooked through. Remove and serve hot. Agreed! Steaming is one of THE HEALTHIEST ways to cook! The dish looks good!